His great grandfather King Lobhengula Khumalo was coronated in 1870 in what appeared like the last coronation of a Mthwakazi King. Fast forward 148 years later his seed has arisen and Bulelani Colins Lobhengula Khumalo will be installed as a new King of the Mthwakazi Kingdom in Bulawayo, Barberfields Stadium on the 3rd March 2018 in what is promising to be the largest gathering of abeThwakazi since the demise of the Mthwakazi Kingdom at the hands of Cecil John Rhodes and his BSAC company in 1893. Dignitaries will range from Mthwakazi chiefs, invited Kings, to various important figures from Africa. The current King of the mighty Xhosa nation will one of the two Kings to officially install Bulelani as a Mthwakazi King. "We are happy that we have been keeping the Mthwakazi Crown Prince here not knowing his status, however, we are pleased that we never received any complaints about our hospitality" King Sigcwawu of the Xhosa nation was heard on SABC News saying regarding Bulelani Khumalo. "Even the President of the African Kings Council based in Ivory Coast is also coming. Zolani Mkiva the secretary General of the Institute Of African Royals has been seconded to us to assist us with traditional technicalities" one of the organisers of the Bulelani Khumalo coronation said in reassuring the Mthwakazi people. 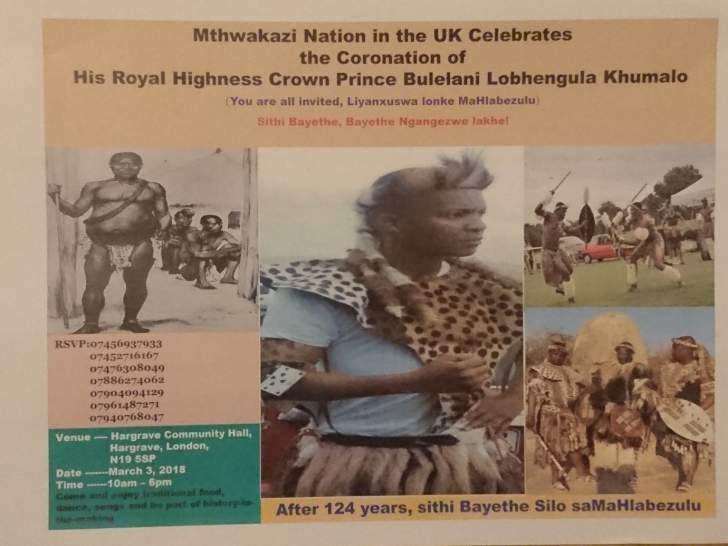 In solidarity with the coronation of Bulelani Khumalo, Mthwakazians in the United Kingdom have organised a celebratory event which will coincide with the coronation on the 3rd March 2018. They will be gathered in great numbers in London at Hargrave Community Hall; N195SP from 10am till late. "Come and enjoy traditional food, dance, songs and be part of the history in the making" the organisers extended their invite to all Mthwakazi people in the UK and all the friends of the Mthwakazi nation. The issue of reviving the Mthwakazi monarchy has reached a crescendo, this started with the celebrations in the early 2000s of what Mthwakazi people called them Mzilikazi Day Celebrations which were celebrated in Mthwakazi; USA and UK; it went on to Gadade commemorations; then to the mushrooming of Mthwakazi music groups; to the emergence of Stanley Raphael Khumalo; Peter Zwide Khumalo and now finally the coronation of Bulelani Colins Lobhengula Khumalo as King of Mthwakazi. "I am aware of the daunting task which has been bestowed on me, however, I am confident that the reason why the elders chose me it was not just mere coincidence, but they have confidence in my abilities to discharge my kingly duties diligently, my task is to do what Mthwakazi people want" Bulelani Khumalo was heard in his first major televised interview on SABC TV recently.